As one of the most connected cities in the world, there has been unprecedented growth in local search engine optimization (SEO) in Toronto. It seems like everyone in the GTA now has a smartphone and everywhere from major chain stores to small cafes has Wi-Fi. Local SEO, unlike organic SEO, is focused on providing results related to the current location of the person performing the search. For instance, if someone searched “best sports store,” the search engine they are using would provide results based on where they were currently standing. This feature is ideal for smartphone users. In the U.S. alone, one in three inquiries on Google is local. Eighty-seven percent of those searches are being made by users on mobile devices, while 95% of mobile phone users use their devices to look up and call local businesses. If you want your business to be one of the top results for local SEO in Toronto, you’re going to need to turn to the professionals. A local SEO company will work to put your business at the top of the results on popular search engines like Google or Bing. This is especially beneficial if your business provides a specific product or service. Local SEO can take keywords that are specific to your business, such as “deck building Toronto” or “laptop repair Toronto,” and create content so when a potential customer enters a specific term into a search engine, your business will come up first. However, if they take your location out, you won’t show up in their results; unless you sell your products internationally, this isn’t going to benefit your organization. Optimizing your products and services for customers in your area, local SEO is the top choice for businesses that are looking to increase their presence on the Web. A local SEO campaign will combine your location with strategically placed keywords to increase your rankings on all the top search engines. 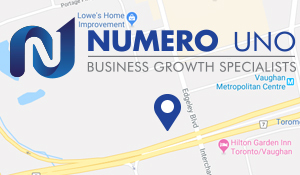 How Can Numero Uno Help You with Local SEO? Numero Uno Web Solutions works closely with our clients to create local SEO campaigns geared towards the area they are located in. Our services are specifically for small- and medium-sized business owners looking to generate more traffic to their web sites. At Numero Uno Web Solutions, we market using proven local SEO strategies and techniques as well as kept up to date on the latest trends in the industry, continually applying this knowledge to our work with our customers. We are the top name in local SEO because we are results-driven and ethical, with our main philosophy being to provide our customers with the results they are looking for. Combine this with our extensive experience in providing small and medium-sized businesses with increased Web traffic and profit and it’s little wonder why we are so successful. Google My Business Profile Creation & Optimization: Our team of experts will create a Google My Business profile page that is optimized to provide visitors to your site with important information, such as hours of operation, reviews, maps, directions to your location, and a street view of your business, as well as images, videos, and more. Bing Places for Business Listing:Learn what their customers have to say about you and review customer feedback on Bing and add a more personal touch to your brand by directly interacting with customers and responding to their feedback instantly. The SEO experts at Numero Uno Web Solutions can help you manage your numerous business accounts on a variety of different online platforms. Local SEO Citation Building Program: Over time, we will build your presence in local business directories over time. This will verify your information and increase your visibility for local customers. Local SEO Competition Analysis: We will take a close look at your competitors’ rankings in local search results and find ways to improve your business’ visibility and citations in local search results. NAP (Name, Address, Phone Number) Optimization:When customers search your business, product, or service online, what they’re really looking for is your NAP: name, address, and phone number (or other forms of contact). Numero Uno Web Solutions can help you create informative, brief snippets that can accompany your online listings so that customers won’t have any trouble locating your business. Online Reviews Monitoring: Find out what people are saying about you using this service. We use proprietary software to provide our clients with monthly reports they can manage and use to improve the online reputation of their business. Premium Local Directories and Review Sites: Build your presence on local directories and review sites like Yelp with this premium service and increase traffic, links, and citations. Watch as your awareness with local customers grows!